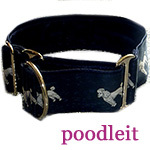 Poodle Blogger: SIT means TAKE A SEAT! Good point you have here. In dog training, owner's superiority plays a crucial role. Besides, a harmonious pet-owner relationship should also begin in the dog's obedience.